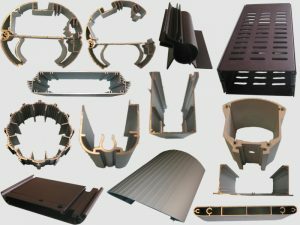 From special extrusions to fully assembled parts INAL can design, manufacture and supply the lot. A two-part extrusion forming a support strut used by the office furniture industry. 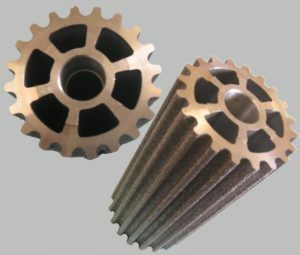 Originally a sand casting, utilising extrusion improves stability, aesthetic appearance and significantly reduces tooling costs. Trunking and lid section used in medical applications. 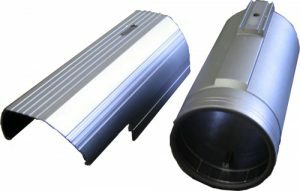 The lid section clip-fits into the trunking section and is machined as required to accommodate the electrical housing. Rear-wing mounting plate used on sports cars with speeds in excess of 200 mph. Machining extrusion enables structural strength to be retained whilst reducing crucial weight. 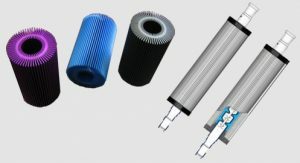 Speaker casings – machined and available in any finish: – anodised, brush finish, powder coated or bright polished. Designed for function and style. Machined & finished to perfection. Used in the off shore drilling industry the SlickSleeve is a casing which fits around drilling tubes to protect the drill head. Operated in an environment which is subject to excessive structural forces – machined extrusion is a must due to it’s superior structural strength. Used in industrial machinery operations. We import the tight tolerance extrusion from Germany and cut it to length, extensive machining in then carried out. It is then Electroless nickel plated, before being masked off and powder coated to a textured finish. Complex machining of aluminium extrusion. This is one were really proud of, the picture shows complex machining performed by Inal Metals on one of our two 5 axis machines. 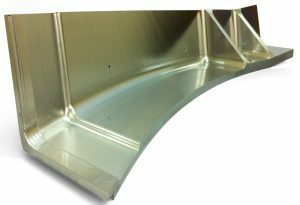 This part was machined from solid aluminium plate, by our 5 AXIS Tekna machining centre that can machine extrusions up to 8.5 metres long in 5 AXIS orientation. This is a state of art machine and all enquiries are welcome because no job is too small and we machine one off complicated jobs on this machine. This set of pictures shows a multi-hollow aluminium extrusion that Inal Aluminium cut and mitre to length. The extrusion is then fully machined on one of our smaller machining centres to very tight and accurate tolerances usually 0.1mm. We then mask it in several places before powder coating and final silk screen printing is applied as the final process. This aluminium extrusion is eventually used on high end inspection equipment and we also supply other parts to complete the machine. These photographs show a special aluminium extrusion that Inal Aluminium manufacture for use in the point of sale industry. We cut the section to length, fully machine it on our VF9 machining centre. We then mask the section and powder coat with a black textured finish; this is then delivered to the customer in special packaging. Special extrusions designed as mating parts. 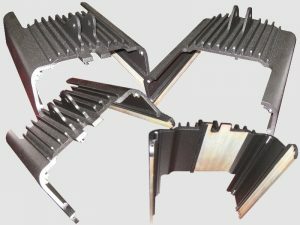 Want mating aluminium extrusions? Well you have come to the right supplier. These pictures show that with the aid of a good design we can supply aluminium extrusions that slide, hinge or clip together. We have our own in-house design engineer who ensures your ideas come to life. These two parts fit perfectly together after we have extruded, cut to length, machined and anodised the extrusions. Watch out they might be monitoring you because their eventual use is as part of a CCTV security system. Unusual finish on machined extrusion. Special finish you name it we can do it for you. The pictures show a special aluminium extrusion and have been cut, machined and finished by a special process. The section after machining is blasted using a stainless steel cut wire peening shot. This hardens the surface which lengthens the life of the product and the rough texture give better grip as these parts are used to move large mobile units. Contact us today to discover the world of opportunities in Aluminium.